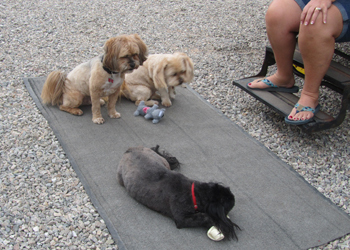 Peggy, Denise, Duke, Sassy and Wookie all spent the day at the salon! I had made an appointment for me to have a manicure/pedicure and appointments for all three dogs yesterday and then Peggy says I need some waxing! Ok, so I call up and they can do her waxing while I get mine done. Peggy and I go to our salon while Paul and Eddie take the 3 dogs to Petsmart for the complete treatment. Peggy and I walk in, I have an appointment, she doesn’t as they said they could just squeeze her in for the wax. But when we arrive one girl is not busy and quickly talks Peggy into a pedicure while I sit and wait for my girl to finish someone else. Peggy ended up getting a pedicure and a full set of nails almost before I even get to sit in the chair! $120 and 2 hours later Peggy and I walk out feeling pretty refreshed. 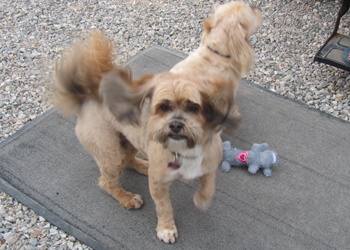 The dogs $120 and 3 hours later are ready to get picked up, with all the dirt removed and new haircuts for all. We arrived in Yuma yesterday feeling pretty grimmy from the desert. Immediately the 3 women rounded up the laundry and headed for the local laundromat. A very nice place with an assistant who helped you locate washers for all your loads and dryers. In less than 2 hours we did 12 loads of laundry and were on our way!! The only thing missing with this laundry facility was they needed a bar nearby as we were parched and still feeling out of sorts from the 2 hour drive down and really could have used a margarita. Thats ok as we took care of that as soon as we returned to the rigs. We are staying at an interesting place. Jim and Debbie Canada have 6 RV sites in their yard and we have 3 of them – actually we have 2 and the Tennants are parked next to their house because Jim wasn’t aware 3 of us were arriving and gave his 4th spot to a couple right before we arrived. 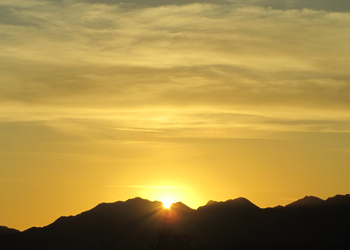 It is very quiet where we are and we have a great view of the Eastern Mountains of Yuma. After laundry and showers our friends we met in Branson, Emily & Wrae and Connie & Charles came by for drinks before we went to dinner with them. After Dinner we returned to Wrae & Emily’s new home which is a lot with 2 RV pads. They are putting landscape in and this will be their winter home – very nice and something that Paul and I might consider someday. The cool part is there is no home to maintain so you only have to worry about some cement pads and a few desert plants when you leave for the summer. Dirt in the desert is like sand at the beach, it gets everywhere! I think Duke weighs about 3 extra pounds and even though I have showered regularly I feel like the dirt is in my pores so we are ready to move to a cleaner part of the desert. 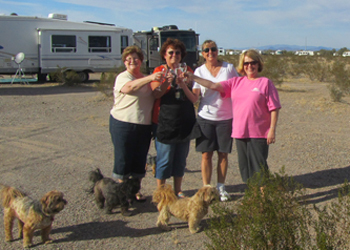 Quartzsite has been fun and now some of our friends have also experienced it. Quartzsite has several hundred of our dollars but most of it was spent in entertainment. I bought waterballs! A very interesting product and we will see if the work as soon as I get a pot and a new plant. Even if they don’t work they are such a cool idea and pretty fun to play with. Paul took the boys to the auction and just the stories was worth the $20 bucks he spent on stuff that either didn’t work or we didn’t need. Anyone want a carton of SlimJim? Infact the boys enjoyed the auction so much they went back for another day and spent even more on stuff they say they couldn’t live without!Janet and Tony King left yesterday and we miss them already but they are happy! 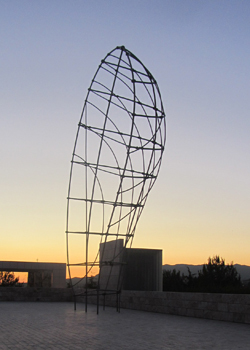 They found a Passport America Park in Mojave for only $15 including cable TV! A step up from the desert and no power. Passport America is a discount program that RVers use often to find that deal while enroute. Today we head for Yuma, AZ where we will meet up with some new friends that we have made through fulltime RVing while still traveling with our old friends the Garvey’s and the Tennant’s, and I get to see my parents who winter in Yuma. The bonus in Yuma is I get to travel out of the country for a day and enjoy some Mexican Food! We started our adventure 2 years ago in this same spot! The land of sunshine, cactus, flea markets and retired RV’ers all living without power or water other than what they carry on board which for some is a difficult task. We come to Quartzsite to meet others like ourselves that are just looking for a bit of summer in the middle of January and we found it. Today was about 78 degrees when we arrived at our spot in the desert. We met our friends Ed & Peggy who are joining us for a few days in the desert. We have 4 rigs and we met some people that Paul and I had met 2 years ago here. There are 8 rigs in our group and hundreds of rigs spread throughout our little area in the desert. 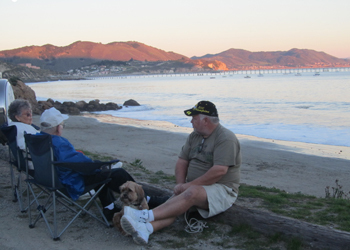 We quickly set up our camp, got out the lawn chairs and got to the important stuff, relaxing and enjoying friends. The afternoon was spent talking about Quartzsite and what we would be doing over the next few days. The 3 couples have not been to Quartzsite before and I tried to warn them but they wanted to come anyway. We plan to see the RV show of course and Paul wants to make sure they see the local legend, Paul the Naked Book Seller! Yep, he is naked. I can’t wait to see the girls faces then! 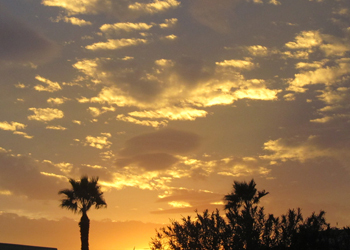 The best thing about the desert is the landscape and the sunsets. Today’s wasn’t the best, but it is the first of the winter for me so I had to take pictures. Here’s to 2 months of awesome sunsets. I don’t think I have ever seen Los Angeles so beautiful! It is still a crazy busy place with traffic everywhere and really fast drivers but the smog is gone and it is absolutely amazing weather. 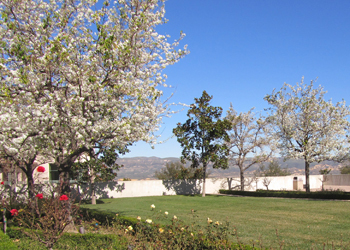 We arrived at the Elks Lodge near Simi Valley on Friday and we have had perfect weather of 78 degrees with no wind, clouds or SMOG!!! 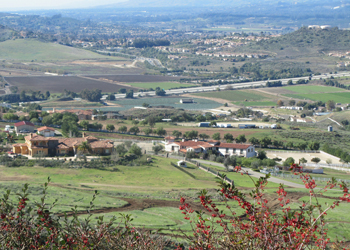 Saturday morning we went to the Reagan Library which is preparing for the 100th birthday of President Ronald Reagan so many of the exhibits were closed for renovations but the big ones were still open. Paul really wanted to see the planes and could hardly contain himself until we got inside Air Force One. 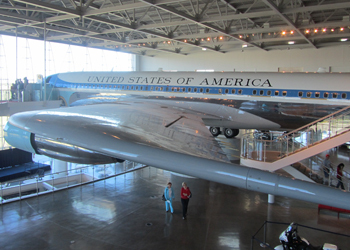 This plane was used by 7 presidents and we got to go inside! As you enter near the cockpit they take your photo and then you can buy it after. 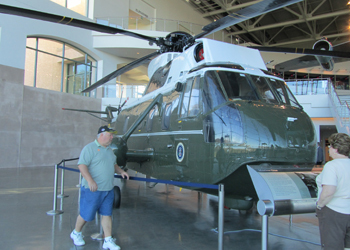 Paul made sure we posed just like the president and first lady however when we went to checkout the pictures he was disappointed as they use a template so you cannot even see the plane! We didn’t get the photo but we looked cute anyway! Inside the plane is pretty basic and blue with way more seating than I thought – all much roomier than coach. 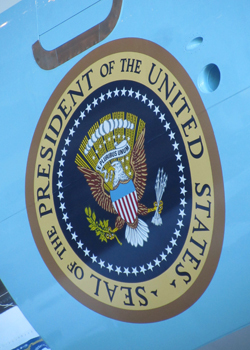 On the floor below Air Force One there is a Presidential Motorcade as well as Marine One. We also saw a Miniature White House Replica that travels to be on display and an exact replica of the Oval Office. 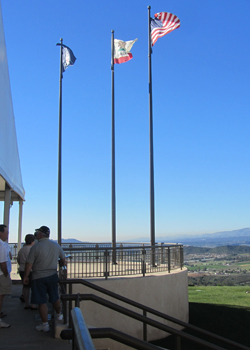 The grounds were beautiful even without the spring color and the views from atop this mountain in Simi Valley are spectacular. Today was a perfect day to visit as we could see all the way to the ocean. Finishing the Library about 3 we headed home for cocktails or a nap – depending on who you are in our little group of 6! After an hour of rest Pat and I decided we still needed a bit more educational stimulation and left the others at the RV’s while we headed to the Getty Museum. We arrived at the museum parking lot at 5 pm which is when it is free on Saturday otherwise you pay $15 to park but the museum is always FREE!! What a deal. The sun was setting as we arrived at the top of the mountain via the Getty Tram and the views again were spectacular. This place is huge and since we had a limited amount of time and a limit on how much more walking my feet were willing to do we immediately got started on the exhibits. The have 5 buildings of exhibits with each building having 2 or 3 floors! We only saw a small part of this museum so I will be coming back next time we are near LA. We did get to see some amazing early French Art and some new impressionist work that I hadn’t seen before. We didn’t get to see much of the grounds as it was quickly approaching dark however the evening views of the valley are quite amazing also. It was a pretty amazing day and I feel so smart right now. I am sure most of my new knowledge will be lost within a day or two especially since we are off to the desert where all signs of intelligence are missing! It has been great traveling with friends and a lot of learning has gone on in the past week. 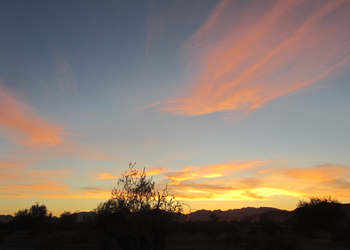 We have one more day before we are in Quartzsite where we will be dry camping for several days. We are prepared and our friends are also now prepared after learning about water in the batteries and how to fix a leak that seems to gush water like Niagara Falls and having to use the neighbors shower just to take that military shower! We should be all set for the desert but you never know when you are driving a house on wheels 55 miles per hour on the California Highway system! Wish us luck! Today we had to leave our little paradise so that we can meet up with friends in Quartzsite on Monday. 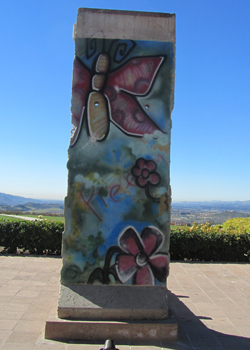 We traveled to Simi Valley where we will stay a couple of days so that we can visit the Reagan Library. 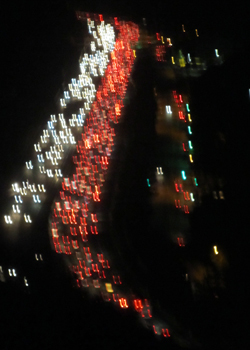 101 south is one of the prettiest highways in our country and everytime we come down it I feel like it is the first time. Today was a spectacular day with temps in the 70’s and not a cloud in the sky! It is hard to leave the beach but we must. A very popular beach on the Central Coast with amazing views, seals putting on a show and the waves crashing on the beach right in front of our door. We love it here and go out of our way to make the stop. 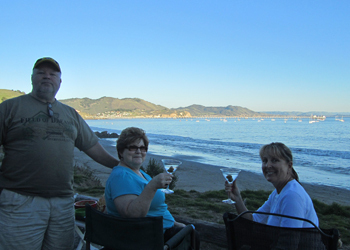 Avila is a small beach town with a working pier, a golf course and many restaurants just above Pismo Beach. There is only one road into town so if you are not planning to come here you won’t see it. 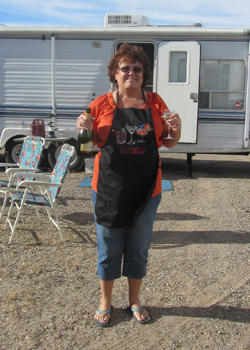 The RV sites are right on the beach which is great – nothing between me and the waves! We are traveling with two couples, The King’s and The Garvey’s so we needed to arrive early to ensure we got the sites right on the beach. We were successful and were set up and ready to enjoy the views before lunch. Having our friends along makes our daily routine way more fun! 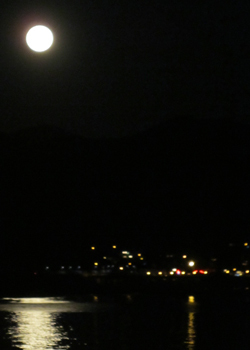 While we were here we had a Full moon which was beautiful reflecting off the ocean. We also got to see a rocket launch from Vandenburg which is very close and we had a great view. As usual, Paul has to make new friends. This couple were traveling in a very small van conversion but that is not a problem cause the reason to come here is to be out enjoying the views. From here we will travel into Los Angeles for a couple of days before heading to the desert. So King City is not a destination that most people put on their bucket list but it is a place we have visited many times and we spent this weekend here again with friends and the square dancing community. Winter Festival with Bob Baier is an amazing experience. The dance goes for 3 days and has some of the best callers and creative, fun dance formations that we have experienced. We have been square dancing since before we had children and have made some life long friends and gotten a little exercise in the mix. Square Dancing is cool and isn’t just for country music type folks. This weekend the caller from South Carolina, Tony Oxendine who is not a country music fan called a tip (that is what we call it when we dance a number!) to a current pop hit “Soul Sister” Very cool! Paul and I love square dancing and don’t get to dance as much as we used to so we really enjoy these weekends where we get to hang out with our friends and dance. Of course the weekend is not just about dancing – partying is very important and each evening always ends with beverages and laughter. Our time with our friends will be changing tomorrow as we begin the next leg of our travels. 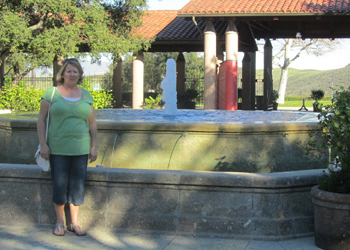 We will be heading to Southern California and then on to Mesa to enjoy the winter in the desert. This next part of our trip is going to be exciting as our friends Kip & Pat Garvey will be traveling with us in their RV! This will be so nice since after a day of traveling Paul & I are usually ready to talk to someone other than each other! It seems that my New Years resolution might have been to stop posting on my blog and it looks like I might have been able to keep that resolution! It wasn’t and yes I broke my New Years resolution by January 2. When we are in San Jose and getting to spend time with friends and family I seem to have less time to chat. We had a wonderful month visiting with everyone and then we got back on the road January 3 for a 1 week trip to Calistoga where we spent the week with more friends. There were 6 couples and we had a great time other than the freezing cold weather and then I got an awful cold. I did get to golf a couple of days although the course was a swamp. They got 20 inches of rain the week before we arrived and they were not able to get on the course and do anything. My game wasn’t that bad although I realize now that I really rely on the roll after the bounce! There was none this week, only the nice splash when your ball hit the ground. We did taste wine from one of the wineries but the wines in Napa are getting way over priced. The least expensive wine on the menu was $35, with Zinfandel starting at $40. Way out of my taste range. From Calistoga we made one last quick trip into San Jose where I got to have dinner with Amy & Stephanie while Paul did some work. We are spending this weekend in King City at a Square Dance and then we will be back on the road heading for the sunshine. Posted in California | Comments Off on Happy New Year and all that JAZZ!